Twists is a style that has been around basically forever. 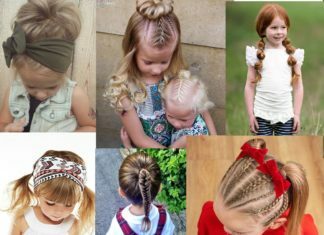 In the early 2000’s they became very mainstream, seeing them styled in a more complex fashion on the heads of little kids and even celebrities. Now that they are widely popular you can see them in an array of colors, lengths, and styles. 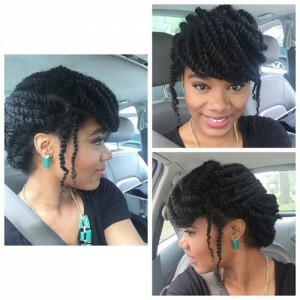 Twists are very popular within the natural hair community and they are often used as a way to do protective styling. 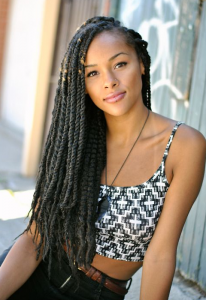 Twists are definitely a style that has been around for a very long time, and will not be going out of style anytime soon. 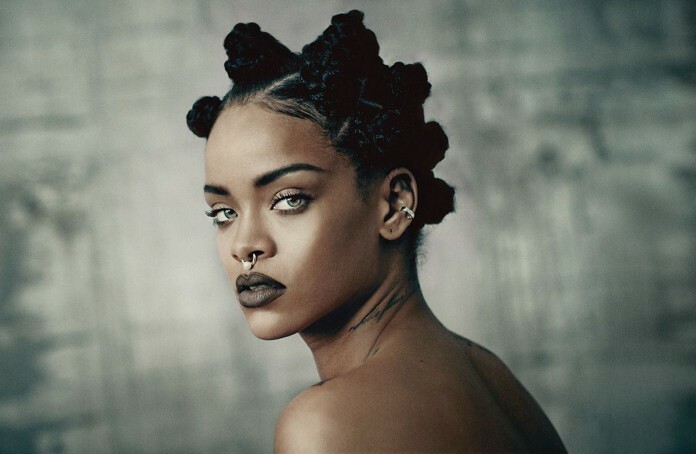 We have compiled a list of 20 timeless twist hairstyles. 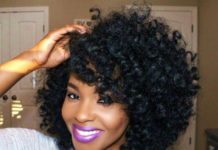 No matter your hair length or type you will be sure to find a style that suits you. We hope you all enjoy these and try these beautiful styles out. 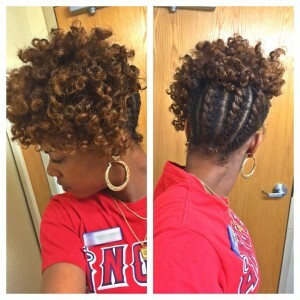 Many naturals put their hair in mini two strand twist as a way of protective styling. Here is a super cute way to pin them out to give them a new look. I love how she created the faux bang and side burns. Here we have this natural hair twisted updo with a twisted swept bang. The first thing that jumped out to me is the hits of red/burgundy. I feel like this gives the look a fun edge because it is a more sophisticated style. Next we have these super chunky short twist also known as havana twist. I love the auburn color and it contrasts with the black roots. 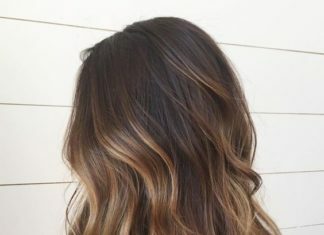 My favorite thing about this style is because the twist are so chunky they’re super easy to do, meaning you can change your color choice frequently without burning yourself out. 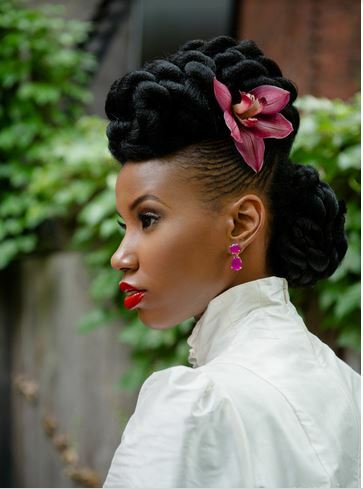 Here we have this super fab flat twist updo for all of my naturalistas out there. Put a twist on the classic twist out. 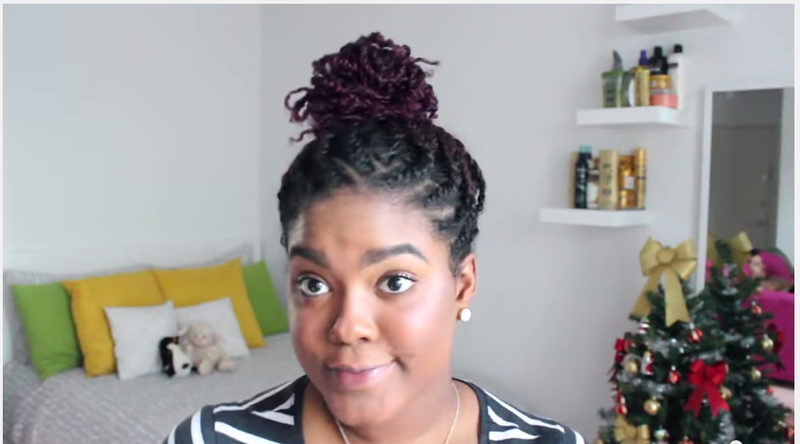 You can even wear the top portion in a bun or in your twist for a protective style for the upcoming fall months. 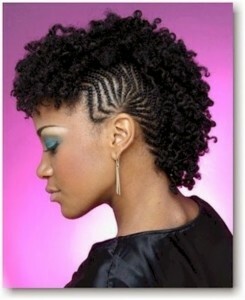 I love this take on the typical Mohawk. 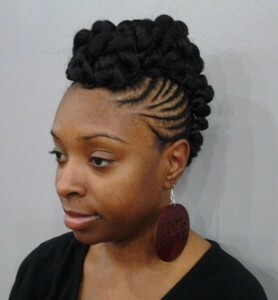 The sides are braided in small braids and then are twisted in pinned into what I call puff twist. Like pictured you should definitely pair this look with large funky earrings. 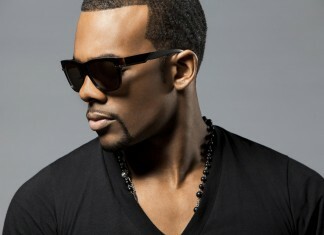 This is a great style for any face shape. 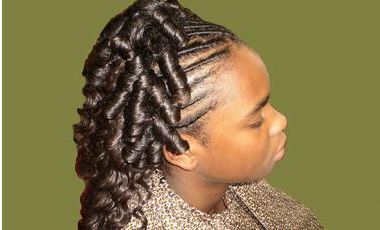 These are marley twist which are the sister to the Havana twist. They are similar in many ways, but the marley twist are are generally smaller and longer. These have been really popular this year, the trend has been really bold colors like blue, purple, pink, and even rainbow. I feel like anyone can wear this even if they’re just plain black. Here we have a super edgy undercut with a geometric design. I love how this edgy look is paired with these fire red twist. Of course I noticed my favorite thing ever, using the hair as a hair tie. Women with caramel skin tones should definitely give this fiery red a try. 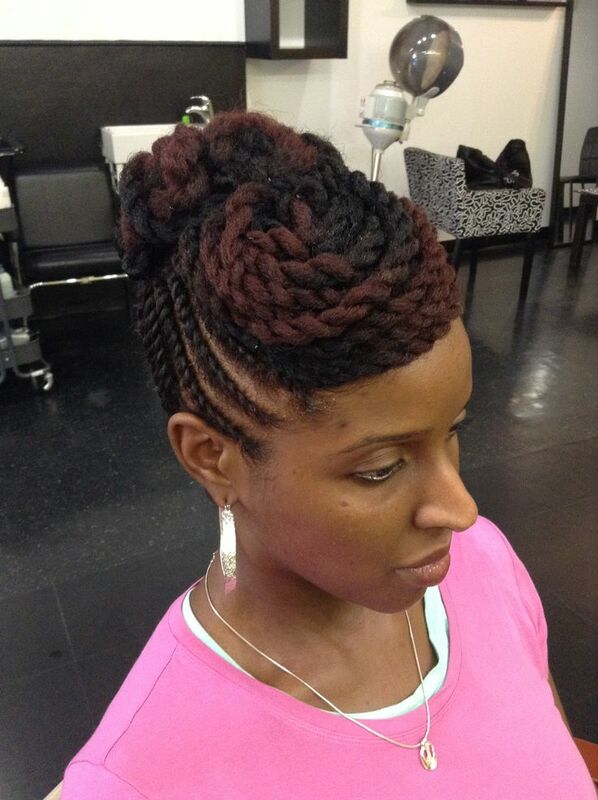 We are used to seeing braids in the cornrow pattern, but this style offers a twist! 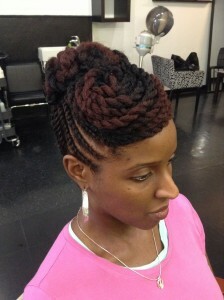 If you don’t have the skills to braid then try twisting it is a lot less complicated. 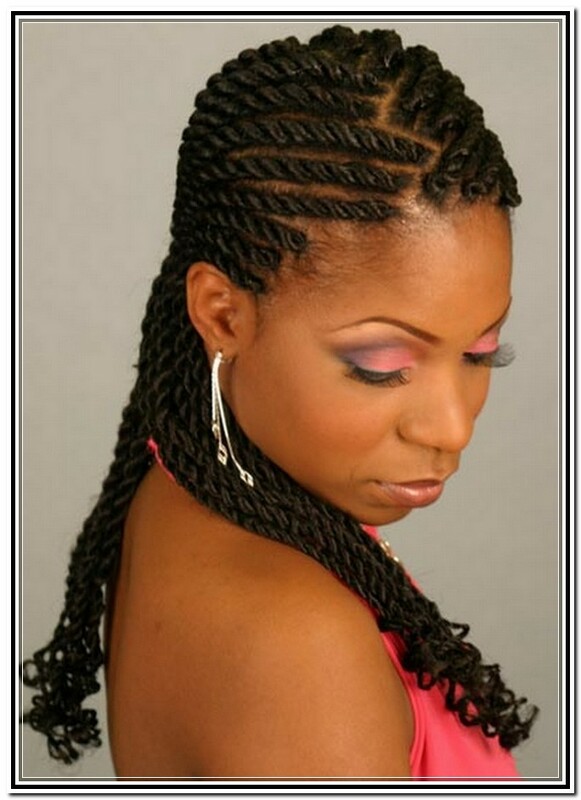 These also put less strain and stress on your hair making them great for continuous wearing. How simple and cute is this bun ? I love that she paired this with a bold red lip and minimal eye makeup, it really makes her green eyes pop. I love this style because it is so easy, versatile, and can be worn in a fun setting or corporate setting. Remember it’s all about how you socialize. here we have this super cute faux hawk. 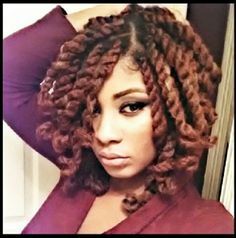 the sides are twisted and instead of the middle being loose they are twisted which makes this a great long lasting protective style. 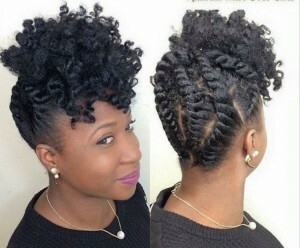 When you want you can loosen out the middle for a curly Mohawk or turn the whole look into a twist out. Ponytails are definitely in ! 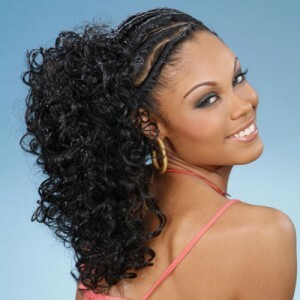 you have seen many celebrities like nicki minaj sporting the sleek and chic ponytail. Try your head with a faux ponytail like this one with flat twist in the front to add some spark to your look. 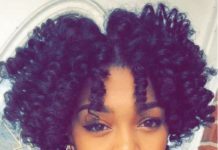 Bantu knots have been becoming widely popular in wearable fashion. At one point, people would look at you totally crazy for wearing them out. Now if you walk the streets of New York and LA it’s a trend. 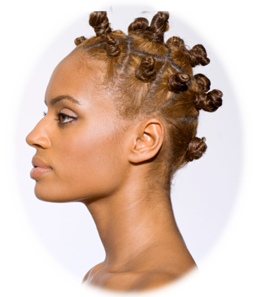 Next time, your hair is not completely dry don’t be afraid to wear your bantu knots out. It’s the norm! Here we have a twisted midi bun. 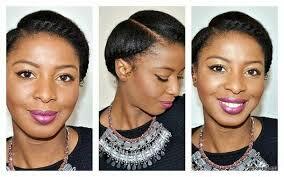 I love how sleek this style is and it is super easy to do especially of textured hair. I suggest using eco styler gel to get the “wet and sleek” look without the flaking of other gels. 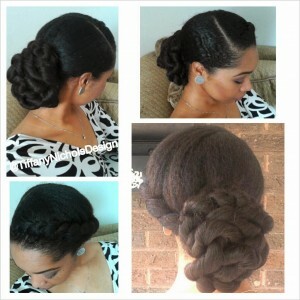 The back is placed in a midi bun that is twisted and pinned. 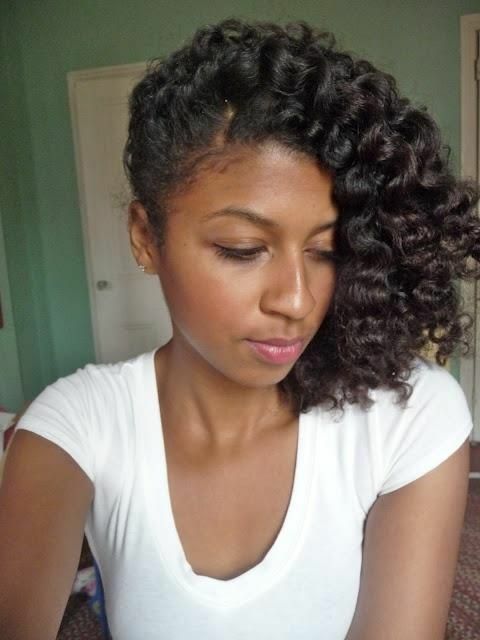 This is a great style for protecting your ends and retaining moisture in your hair. I love curls. I love how they can be dressed up or dressed down. Here we have simple flat twist with spiral or shirley temple curls falling to the back. Want to avoid using direct heat? simply roller set your hair while damp, don’t forget to use your favorite setting lotion, and sit under a hooded dryer for 45min to an hour. 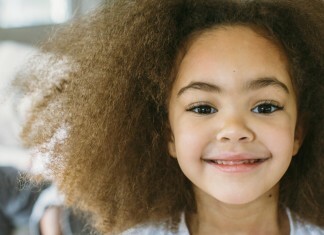 Not only will you avoid heat damage but your curls will come out softer and with more volume. To maintain roll them in bigger sections and add oil as needed to reduce frizz. Here we have a super cute puff that is flat twisted to give it a bit more jazz. This style gives me a 80s vibe all the way. You can rock this with a bantu knot out or a twistout. It is very easy to maintain remember to protect your hair at night with a satin scarf. I am head over heels in love with how chic this twisted hawk is. This model definitely giving me island vibes with the added flower and pop of color. This is a super fun look for the workplace and to go out on the town with your girlfriends. 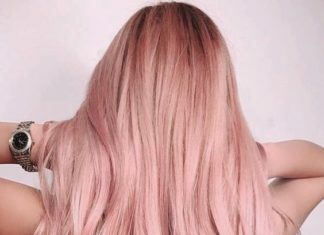 It shows off all of your unique and amazing features so I feel like this is a great style for any face shape. Are you a college student, or a girl boss or even a mom on the go? 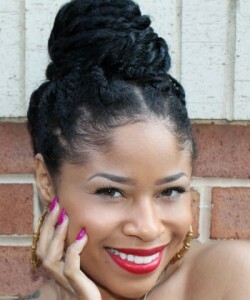 This flat twist style can be worn up in a bun or even out with a cute headband. This style is very low maintenance all that is required is moisturizing. Throw on a cute pair of earrings and you’re out the door. 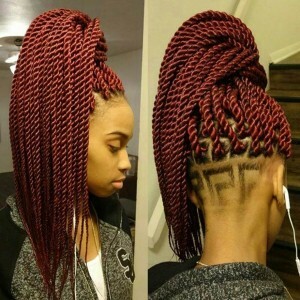 We are use to seeing the french braid but an alternative is the french twist. 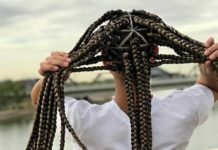 Let’s face it not everyone can braid and not everyone has the time too. The french twist is super easy to do. Dress it up with your favorite lipstick or favorite necklace as pictured here. The final look is more fun hairstyle. I would love to see this on a night out or special occasion like a birthday. 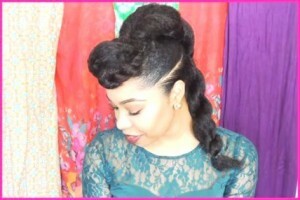 It is super chic with the sleek sides and a jumbo twist acting like a faux Mohawk. Pair with a little black dress and killer heels.